Injured Wallabies lock Sam Carter hopes to use Australia's National Rugby Championship to prove his fitness and secure a spot in Michael Cheika's Rugby World Cup squad. 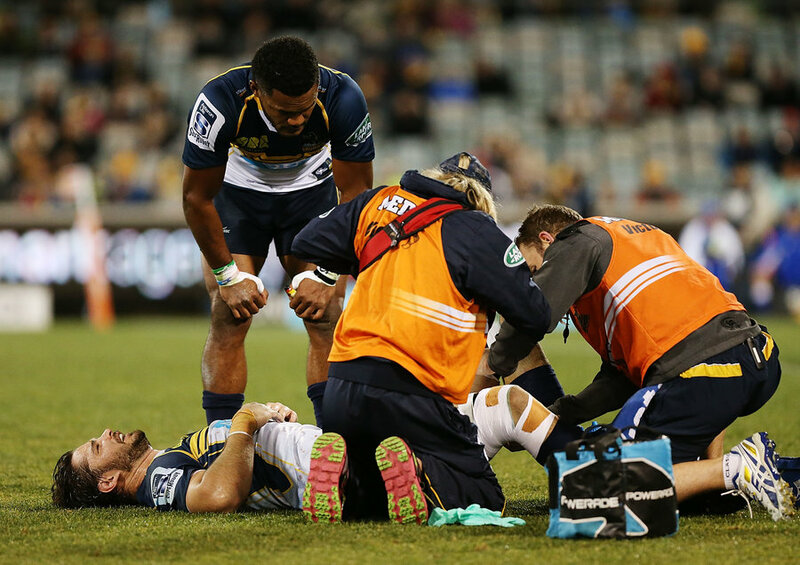 A defiant Carter has wasted little time wallowing in the pain of the knee injury he suffered playing for the Brumbies against the Bulls a fortnight ago, already mapping out a timeframe for return after a visit to renowned knee specialist Dr Peter Meyers. While disappointed to be missing what would have been a third straight finals campaign with the Brumbies, Carter acknowledged his knee injury could have been far worse; a fate suffered by All Blacks playmaker Aaron Cruden. "I heard a crack when I did it and, yeah, it hurt a fair bit at the time," Carter told ESPN of the moment he suffered the injury. "The physio and the doctor came over and had a look at it and made sure it wasn't the big one, the ACL, and they strapped it up and told me to go for a run on it. So I did that and obviously knew it wasn't working out so I came off." Knowing time was of the essence, the Brumbies quickly made the decision to fly Carter to Brisbane for a consultation with Dr Myers, the surgeon who twice performed reconstructive surgery on Carter's in-form Brumbies team-mate, David Pocock. "It happened over the weekend, they said 'look, it might not require surgery but it's better off to go in and have a look anyway'. It wasn't going to change the recovery time, so I went up [to Brisbane] and saw Dr Meyers and he treated me on the Tuesday. He [operated] and then said the MCL wasn't as bad as he first thought; it was just the fracture on the right side that was the main concern. So it didn't change the recovery time; they've given me a kind of 10-12 week window and that's what I'm aiming for. "I came straight back to Canberra and it's been two weeks off feet, on crutches, and then obviously six weeks in a brace. And once you get out of the brace that's kind of when you can ramp it up. I've got the Brumbies blokes working with me; [strength and conditioning trainer] Benny Serpell and the physio, Byron Field. I've had injuries before and come back really well with those blokes. So I'm just down here [in Canberra] training up, getting ready." 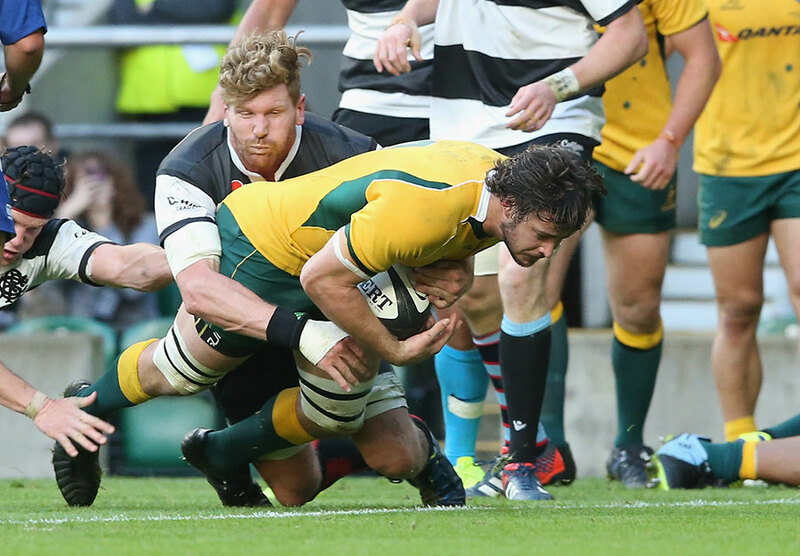 Carter will play no part in the shortened Rugby Championship or the second Bledisloe Cup Test in Auckland, limiting his opportunities before the Wallabies' World Cup squad is named. But he has set his sights on a comeback through the NRC and hopes a handful of games in Australia's third-tier competition may be enough for Cheika - whom he spoke to ahead of surgery - to offer him a ticket on the plane to England. Features: How well are Australia prepared? "It's looking towards the end of August; I definitely don't think I'll be thrown straight back in," Carter said. "But hopefully if I can get a game or two, maybe in the NRC, and put my hand up for selection that way. My main focus is just getting ready, and getting back running as soon as possible. "He [Cheika] gave me a call before I went into the operation last Monday. We didn't talk too much about it; obviously he said it's a pretty disappointing thing to happen. But he just said the main focus was to focus on getting it right and to get back playing as soon as possible to give myself the best chance; that's realistically the only thing I can do at the moment." Meanwhile, Carter is confident his Brumbies team-mates can prove a force in the Super Rugby play-offs, providing they negotiate a tricky encounter with the Crusaders in Canberra on Saturday. Pointing to the final Super Rugby game for Crusaders greats Richie McCaw and Dan Carter, the Brumbies lock said the game wouldn't lack intensity despite the seven-time champions' failure to qualify for the semi-finals for the first time since 2001. "The whole team has come into form towards the end of the season the last couple of years; it's something that's been working for us. Obviously we've got a very tough match against the Crusaders this week and, while they're not in finals contention, they're by no means not focused on winning especially when they've got a couple of great players to farewell. So it's going to be a very tough battle this weekend."